Staying safe and healthy while traveling isn’t always easy. Despite your best intentions and most thorough preparation, disaster can strike, whether it’s as small as a rental-car fender bender or as serious as a hurricane. Thankfully, technology can help. Prevent on-the-road catastrophe—or learn how to cope when it occurs—with these must-have smartphone apps. 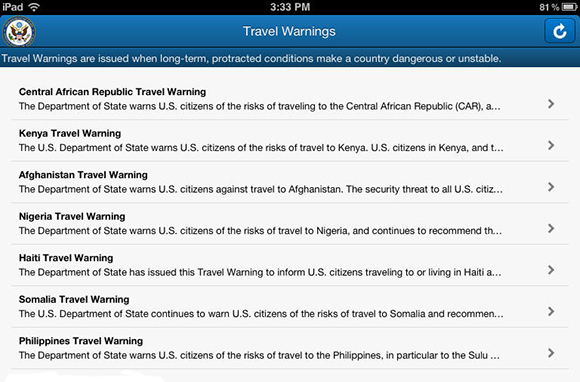 Be the savviest world traveler with this mobile app from the U.S. Department of State, which rounds up official country information, travel alerts, travel warnings, maps, U.S. embassy locations, and more. Check your destination for updated safety and security alerts or access a list of embassies should you need help recovering a lost or stolen passport. You can access the Smart Traveler Enrollment Program, which can help your family and friends reach you in the event of an emergency, such as civil unrest in a foreign country. Best of all, the app features a great airport time-waster: Simply shake your device and get official information about a random country. Available for free on Android and Apple devices; State.gov. 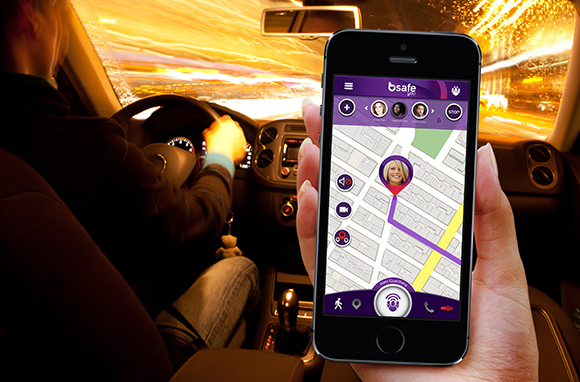 This personal-safety app is packed with features designed to keep you secure on the road or at home. 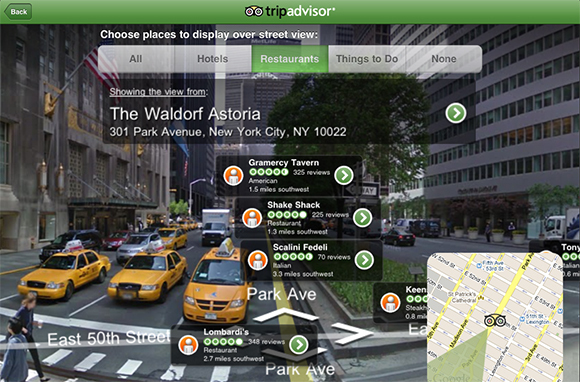 Set up a personal network of friends and family, and send notifications of your location using GPS-enabled service. Use the timer mode to send automatic alarms if you have not checked in to pre-appointed locations, and even set up a fake incoming call to remove yourself from unwanted conversations. Live GPS tracking makes it easy to meet up with friends or family and to ensure that everyone gets to their destinations safe and sound, especially in unfamiliar cities. If an alarm is triggered, your phone can even transmit a siren sound and record video. Available for free on Android and Apple devices; GetBSafe.com. Traveling to a hurricane-prone destination? A weather app is a great basic for your garden-variety rainy days, but in the event of more serious weather events, you'll want a more serious app to match. 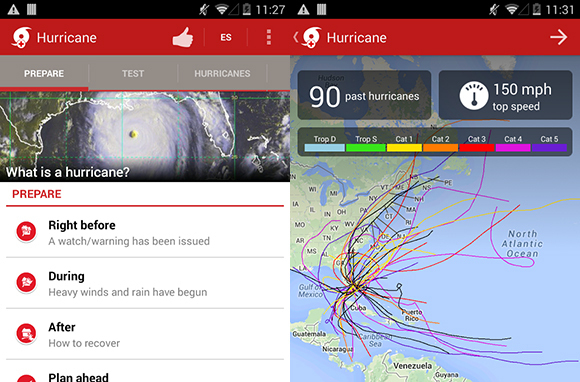 Get the American Red Cross's Hurricane app to track and monitor conditions for your area, download simple checklists for hurricane preparedness, access a toolkit with a flashlight, a strobe light, and an audible alarm, and use a one-touch "I'm Safe" messaging system to alert loved ones in the event that a storm hits and you can't be reached. You'll also receive NOAA weather alerts when location services are enabled. Available for free on Android and Apple devices; RedCross.org. Everyone knows that you dial "911" for help in the U.S., but do you know the emergency numbers in your travel destination? You needn't write them down or look them up. Just download the seamless Travel Safe app, which features a list of emergency numbers in your location on an easy-to-access home screen that features one-touch dialing. Simply enable the location services and the app will automatically detect your location to access medical, fire, and police numbers; if you don't have Wi-Fi, you can manually set your location. You can also create a custom list of emergency contacts and personal information for emergency responders. Available for $0.99 on Android devices and on Apple devices; LKapps.com. 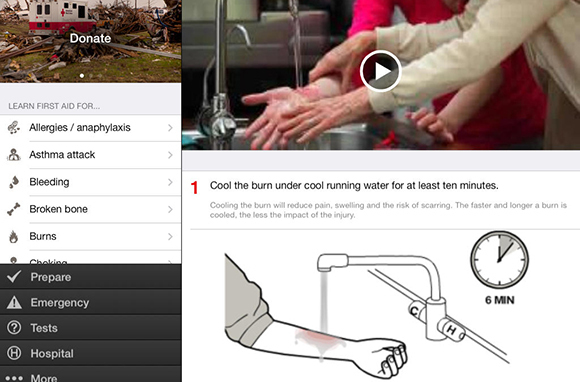 Another essential tool from our friends at the American Red Cross, this first aid app contains everything you need to know about emergency medical intervention, whether you're battling bush snakes in Australia or simply a sprained muscle at the Magic Kingdom. Access step-by-step medical-care instructions for a number of injuries and illnesses; preloaded content means that even if you lose a data or Wi-Fi signal, you can still access safety information in the event of an emergency. Best of all, fully integrated technology allows users to make emergency calls directly within the app at any time. Simply getting to your flight on time, with all bags accounted for, can be a challenge. The GateGuru app helps avert airport disaster with a number of features designed to keep you organized—and sane—while traveling. The JourneyCard stores your itinerary and displays security wait times, flight delays, gate changes, and layover adjustments on one easy-to-find screen. The AirportCard gives you easy-access airport-amenity information, maps, weather forecasts, and traveler tips. Never again will you be surprised by a terminal change, a nasty thunderstorm, or another vacation-ruining revelation. Available for free on Android, Apple, and Windows Phone devices; GateGuruApp.com. This app's new offline functionality, which launched earlier this month, is a great asset when Wi-Fi access is spotty or an overseas data plan impossible. Simply download the data for your destination before you arrive. Even if you lose your data or Wi-Fi signal, you'll still be able to access reviews, photos, and city maps—meaning you won't get lost in a strange destination (or have to rely on strangers for help). The app contains dozens of offline city guides available for download, with more in the works.